As of midnight last night weather.com had the forecast as sunny until 1pm with a 30% chance of rain. I got up at 6am....very early for me....and it was POURING. Uggggh. I decided that since I was up so early I might as well return the air compressor early and get some money back. Nope. No credit for early return. So a day and $55 wasted. I guess I can spend the day getting all of the fabrics I need and polish windows. 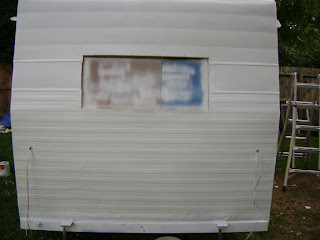 Belle was primed with 2 coats of white primer on Monday…although not without issues. Monday morning I decided to give my little air compressor another try, a mistake that cost me a couple of hours. This thing was only powerful enough to get one swipe and then I had to wait 3 minutes for it to fill up again. I know what you’re thinking…you already knew it worked like this so why deal with it at all? 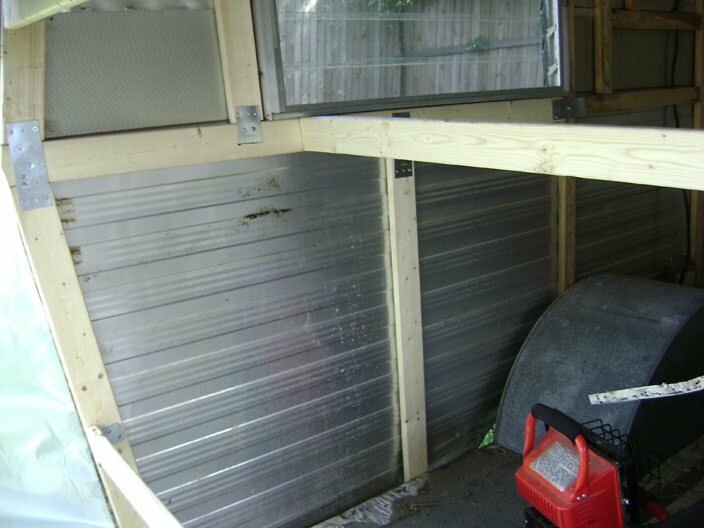 Well, to be honest I didn’t want to spend the money to rent a bigger air compressor. You can guess where I ended up at noon…Home Depot. The guy there told me that their electric air compressor would do the job with minimal waiting, but I wasn’t having it…I didn’t want to have to wait for anything to fill up…I just wanted to paint. So I ended up with this monster gas powered- $110- air compressor. 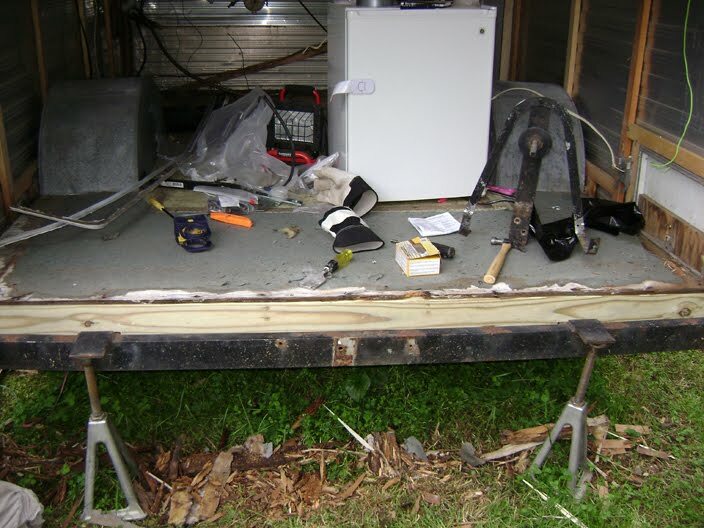 I even had the other customers helping me…one wanted to make sure that I had a gas can at home. I guess I looked that stupid. I thanked him and told him I was pretty sure I had one since I have a lawn mower. 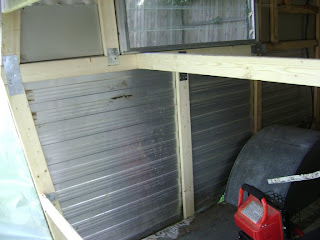 The nice guys at Home Depot loaded up the “mine for 2 days” air compressor and I was on my way. Thankfully we live in a historic neighborhood that has alleys so I was able to pull the truck up to the back yard gate, but there I am all by myself wondering how the heck I’m going to get this beast out of the truck to use it. There is no way, but I’m resourceful, so I just open the gate, back into the yard right up to Belle and start it up. I just hope I don’t paint Joel’s truck. 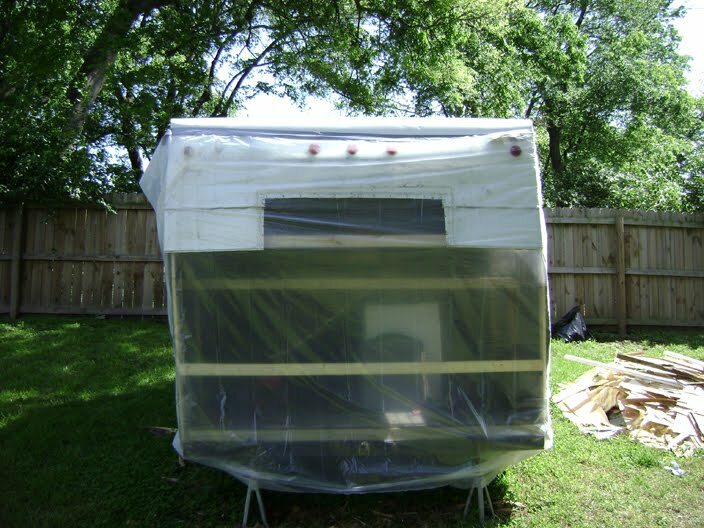 This puppy was well worth the $110 cause I’m smokin’ now….until my paint gun gets clogged…again. At this point I’m ready to return this stupid thing and get a new one…I’m convinced that it’s broken. But I figure I should call the expert first. It turns out that I should have been filtering the paint first. That little tip would have been good about 4 hours ago. Silly me to think that the paint would be free of “junk” when I bought it. I run inside to grab some pantyhose and filter away. I’m telling you, that made all the difference. At the end of the day Belle looks a million times better and I learned a few lessons on painting. 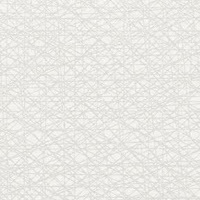 Westinghouse White goes on Tuesday. I get to work bright and early on Tuesday….a hard thing for me…the bright and early part. I make a quick trip to Sherwin Williams to get some real paint filters…a lot cheaper than pantyhose and I start with the roof. I realize very quickly that with the combination of painting white on white and the sun glaring down and reflecting off of the roof, I can’t see what I’m doing. So I had to run in the house and grab some sunglasses. That made things a little better, but I was still having a hard time. Fortunately, the sides all have grooves for me to follow. Who’s going to see the roof anyway? The paint is going on much smoother than yesterday, but it’s just not a shiny as I wanted it to be. Time to call the expert to see what I can do about this. Tonight I will tape off the z stripe and tomorrow the green will go on….all before noon or my air compressor turns into a pumpkin. Or maybe it will just cost another $55. OK, so I didn’t get to paint on Friday, but I did manage pick up the paint. That has to count for something, right? Thanks to my brother in law I got the hookup on paint….1 gallon of primer and 2 gallons of paint all for $65….and this is the good stuff…industrial enamel. Sweet! 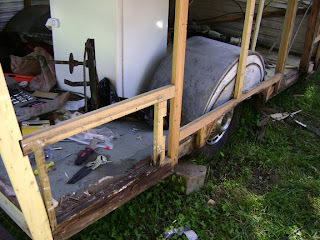 Saturday was spent getting Belle prepped for paint….removing the last few bits of silicone…I really hate that stuff, just when I thought it was all off…more…uggggh….anyway, I also removed all of the windows, scraped off the butyl tape, used the wire wheel to get the rust off of the bumper….etc. Here she is all ready for paint. 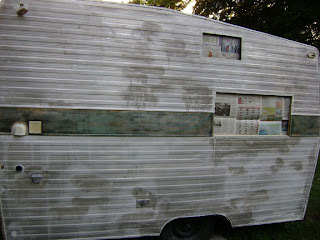 I tried to start priming late on Saturday, but I had issues with the paint gun. 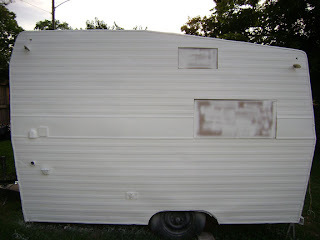 You have to keep in mind that I have never used a paint gun….ever. So I tried a few passes on some scrap wood and it came out well enough so I moved on to Belle. As it turns, the tiny air compressor that we have doesn’t work all that great for painting. I guess I shouldn’t say that it doesn’t work that great, it just doesn’t work that quickly. After a few passes, I had to stop and let the tank charge or fill up or whatever it does to paint again. Very time consuming, so I didn’t get too far with priming. Sunday will be the day! Except that it was raining on Sunday. Can’t I catch a break? After the rain stopped we weren’t sure if it was going to start again as wheather.com had evening showers in the forecast, so we decided to work on the paneling. 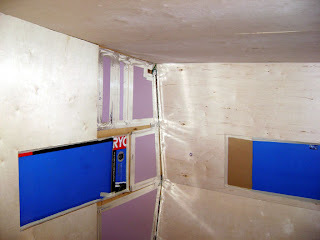 I can’t believe how quickly the paneling is going up, I’ve got Joel hot on my heels as I’m trying to finish up the insulation. Check it out, it’s purple! If Belle can’t be purple on the outside, she’s going to be purple on the inside. 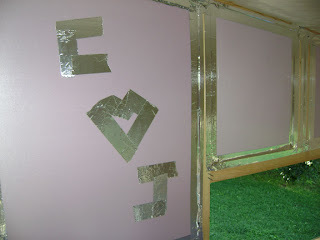 We left our mark too.....awwww! Check out the birch. 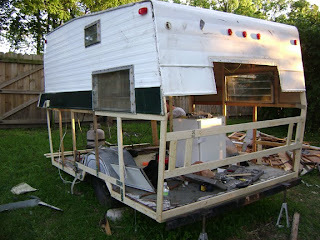 We got the front, roof and back done as well as most of one side. Looking good. Maybe Joel will stop calling her by her nick name…..Piece of Crap…..and start calling her Belle again. I still need to stain and install the trim pieces that will hide all of the seams, but whoa what a difference. I made Lowes run to pick up a couple of sconces for the rear. I think they will go nicely with the sputnik light I’m working on for over the table. No rain in the forecast for MOnday or Tuesday, so Monday prime…2 coats and sand…Tuesday…paint the top half of Belle. By the way, it never rained again on Sunday. I know it’s been forever since an update. A lot has been going on here....unless you’ve been sleeping under a rock for the past month you know that Nashville flooded. We were very fortunate that our house didn’t flood…neither did Belle, but the city pretty much came to a stand still. It was only this week that the city lifted the mandatory water restrictions. So now not only can my car have a bath, but so can Belle. Yay! Alright, here’s what’s been going on with Belle….. 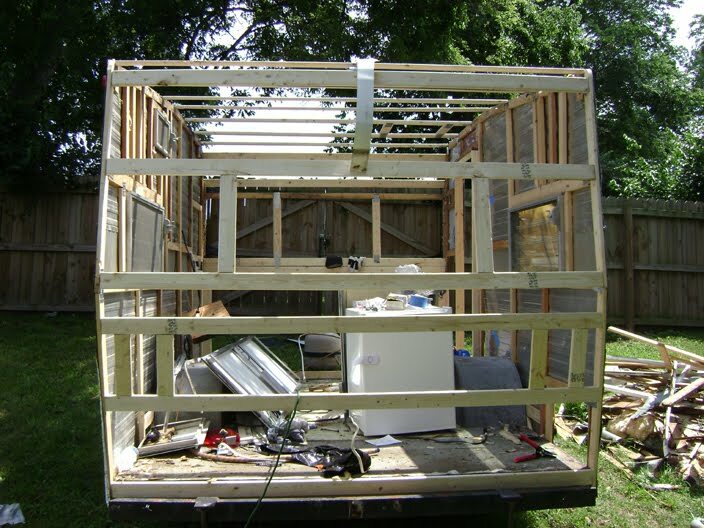 When we purchased her, I thought that all we needed to do was replace the interior paneling and cabinets…more out of desire rather than need….and rebuild the frame for the back wall….slap on a little paint and go to town decorating. NOPE!!! 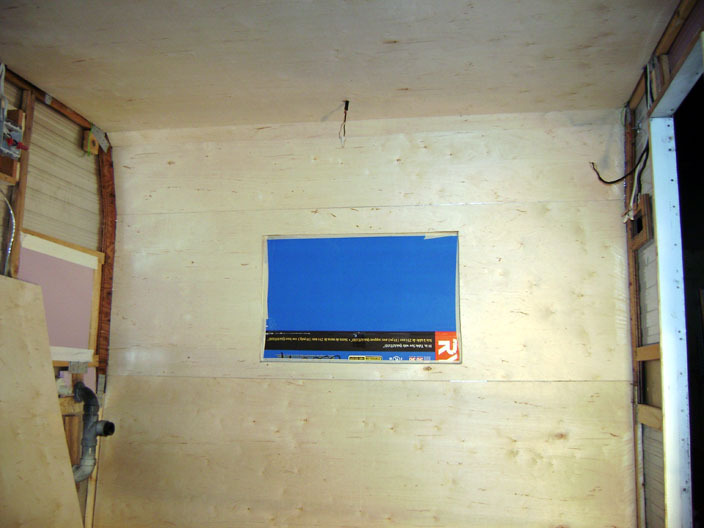 As we removed all of the paneling and skins, it became apparent that MOST of the framing would have to be replaced. I would say that the framing is about 85% new. Originally there were 1x2 as studs, but we decided to go with 1x3s to make it a little more structurally sound. 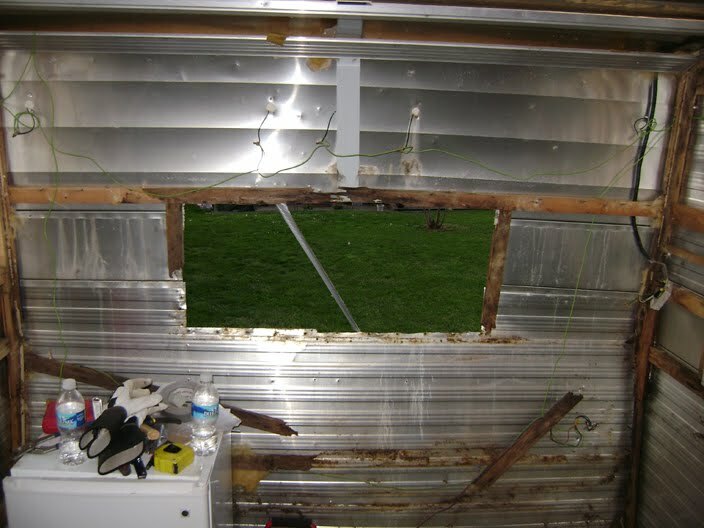 We also replaced the staples fastening the studs together with metal plates…..definitely more structurally sound. 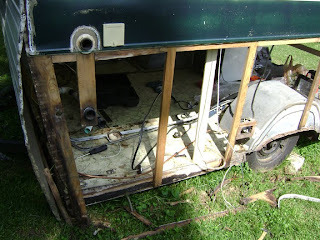 Belle now has all new wiring both for trailer lights and electricity inside. I’m glad that Joel tackled that one cause it was the biggest “I don’t know” for me. 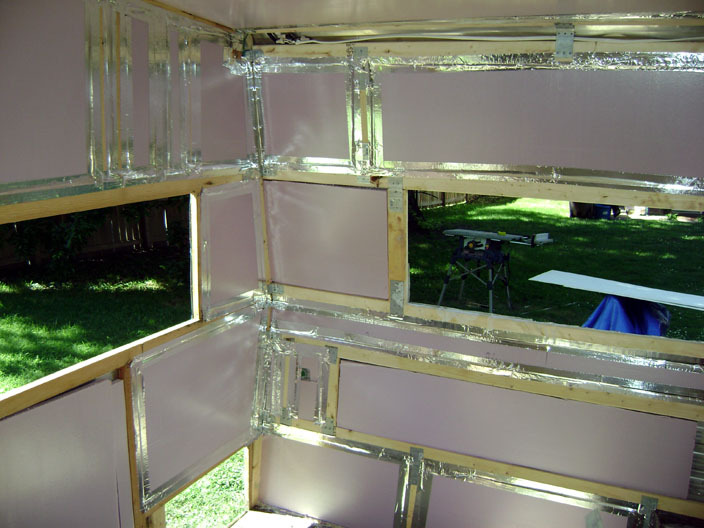 Belle got naked a couple of times so that we could scrape off the old Butyl tape between the aluminum skins and replace it with new stuff. 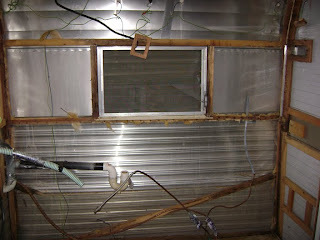 If you remember, when we got Belle she had an awful air conditioner hanging out what should have been the rear window. Well, whoever did that to her used a whole tube of silicone caulk to try and stop the leaking. 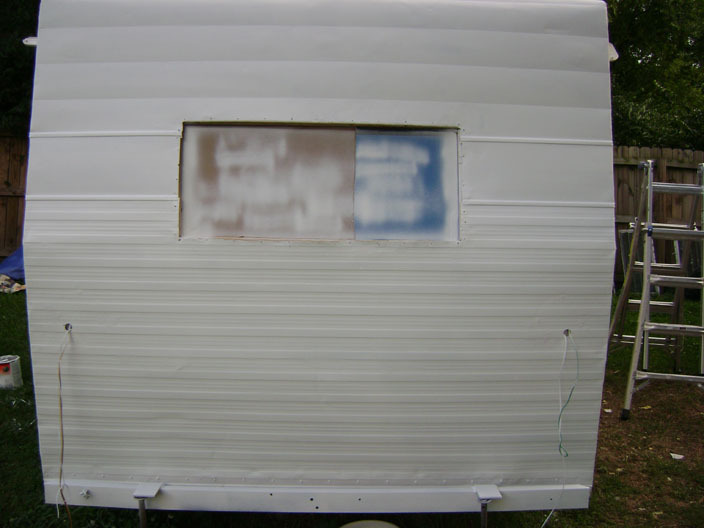 Even I know that silicone is a big no no for travel trailers….that crap does not come off. So I did a little research on how to remove silicone from aluminum and found that it you scrape off most of it with a razor blade you can spray oven cleaner to get the rest off. Well that really didn’t work for the silicone, but it took all of the paint off where I sprayed. So that got me thinking, I just spent about 2 hours trying to sand down a very small area and didn’t get much off so why not use the oven cleaner to get the paint off. 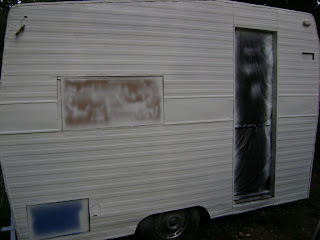 That’s right people; I used regular old oven cleaner to strip the whole trailer. All it did was spray the whole thing down, waited 20 minutes and sprayed off the bubbled up paint with the hose. All the paint came off…just like that. It probably would have worked a little better if I had a pressure washer, but the regular sprayer that I had worked fine. I just had to go back with a scrubber in a few spots. Who would have thunk, regular old oven cleaner would be the best paint stripper….and cheap too. Although, I must say, when I ran out of my Easy-Off Fumeless Professional I ran to the grocery store to get a can of their off brand oven cleaner and it didn’t work as well. So if you are going to use the Cristen method of removing paint, go to Lowes or Home Depot and get the Easy-Off Professional…they don’t sell it at Target. So the whole reason for stripping Belle to the bare aluminum was to get crazy with Bondo. My intentions when purchasing a whole gallon of Bondo were to smooth out any and every ding on her. LOL!!!! What a lofty idea. All I managed to do really well with the Bondo was to cover the holes left by removing the marker/clearance lights from the front and back. Why remove the lights? Well, I had one missing from the front and one missing from the back. I found replacements, but then I thought the shinny new light would make the other 4 old ones look like crap when installed…..and if you scroll down and look at my “Goal” it doesn’t have marker lights. I gotta say, Bondo is really hard to work with because it dries in like 2 seconds, but I did a good job filling those holes. 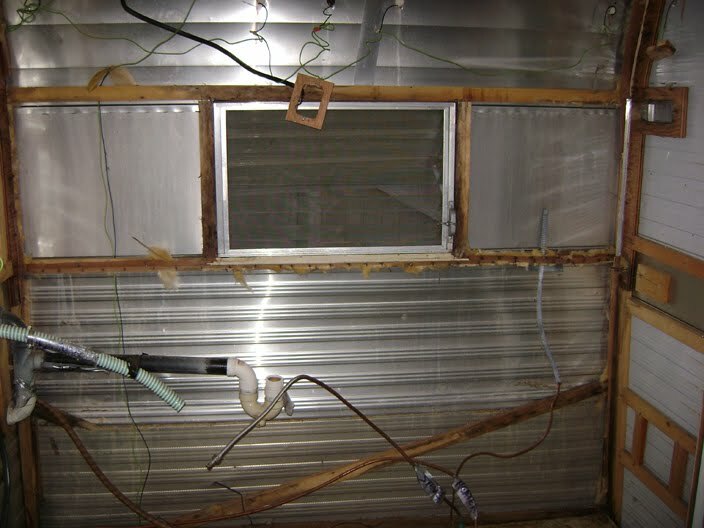 So where does that leave us….new framing, new wiring, new Butyl tape, holes filled with Bondo, stripped down and ready to paint. 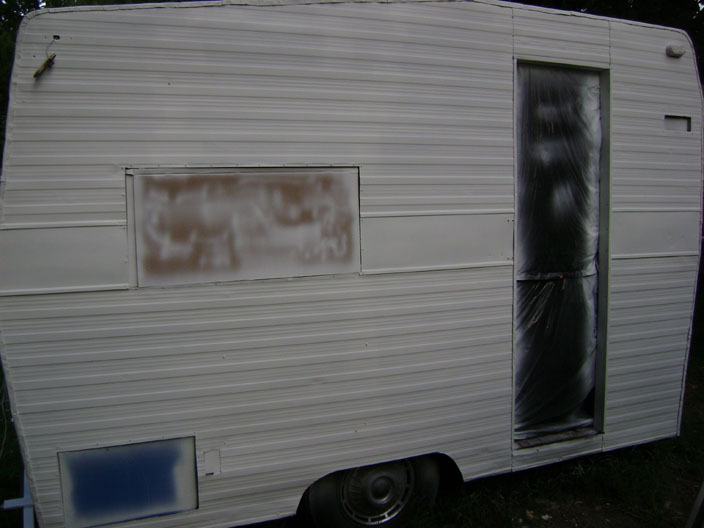 I have changed my mind on the paint….of course. I decided that I should go with something a little more retro/traditional just in case I don’t like camping and we need to sell Belle. So I decided on Leaprog Green for the bottom and Westhighland White for the top. The green matches my fabulous green oven. We are down to the wire now and getting to the good part…decorating. I have been going crazy ordering things. We have brand new reproductions of the original “wedding cake” tail lights. I can’t wait to get those on. 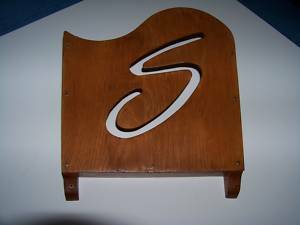 I also got an original Shasta magazine rack....Shasta Compacts didn't come with these, but I think its pretty cool so I really wanted one. 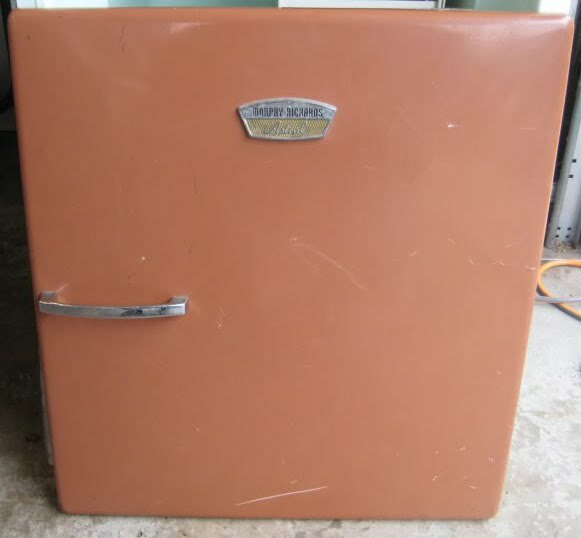 I just got an old refrigerator door from a 1960 Shasta…thanks to Dennis. Its brown now, but it will be painted green to match the oven. I’m going to use the refrigerator door as a cabinet door to hide my modern, tiny, refrigerator. I tried really hard to get the matching green refrigerator, but everyone that had one wouldn’t sell just that…and I wasn’t going to buy a whole new Shasta just to get a green refrigerator. I think that I like this one better anyway…its curvy. 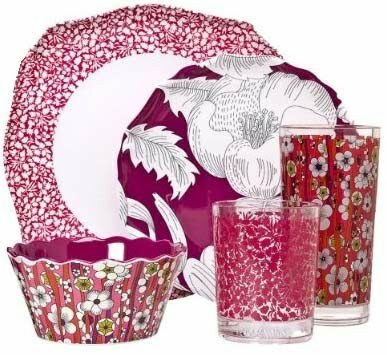 I have dishes too. To be honest, I bought these the week after we got Belle. Priorities. 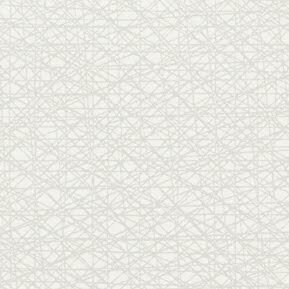 I decided to go very neutral on the interior for everything that isn’t removable…..just in case. 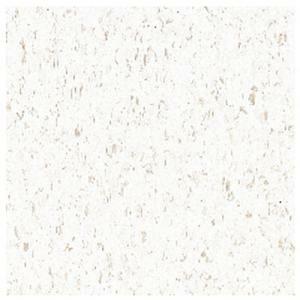 The Formica for the countertops and table is VirrVarr White…very retro. 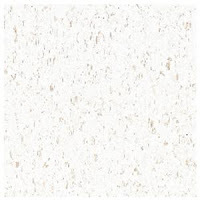 Armstrong commercial linoleum in white for the floor. All of the cushions will be covered in white vinyl….and the pillows and curtains…easily removable and changeable…will be in pink and green to match the dishes. I’ve ordered everything that needs to be ordered….new aluminum trim for the countertop and table, new screen for the screen door and new drip caps for over the windows. We’ve got a lot to do this week. Primer goes on tomorrow. 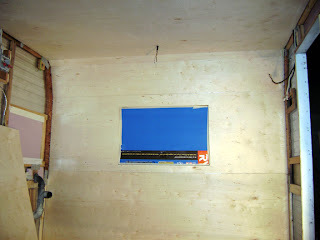 Paint started on Friday and new birch paneling gets cut and fitted. Saturday more painting. Sunday install flooring. Busy Busy. Dustin & Nick, you might want to skip this post. Sunday morning Joel was given a choice, work on the fence or work on Belle. 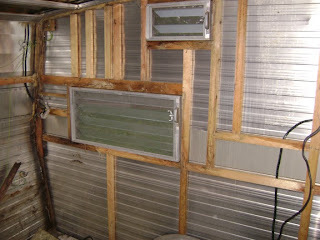 Yes folks we have other projects….we recently purchased a 90 year old house……many, many projects. Since Joel didn’t particularly want to work on the fence, he chose Belle. Yeah! You see, I’d been at a standstill for a while because I couldn’t get the spare tire rack off of the back to work on rebuilding the rear of Belle. It turned out that the bolts were rusted on so he had to bust out the grinder to get it off. 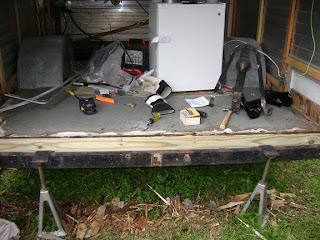 While Joel was dealing with the spare tire rack I was removing all of the screws from the back railings. I found that most of the screws were so rusted they were barely hanging on. Note to self: Replace all exterior screws with stainless steel ones. With the screws out and the tire rack off, we were able to remove the bottom piece of skin to get a really good look at the damage. As suspected the bottom of the wall was rotted. 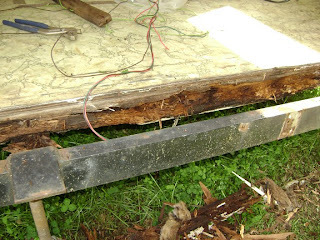 What we didn’t expect was the back 2x3 frame was completely rotted. It just crumbled when you touched it. By now the sky is looking pretty dark and since I’m already at Home Depot for a 2x3, I throw a tarp in the buggy just in case. 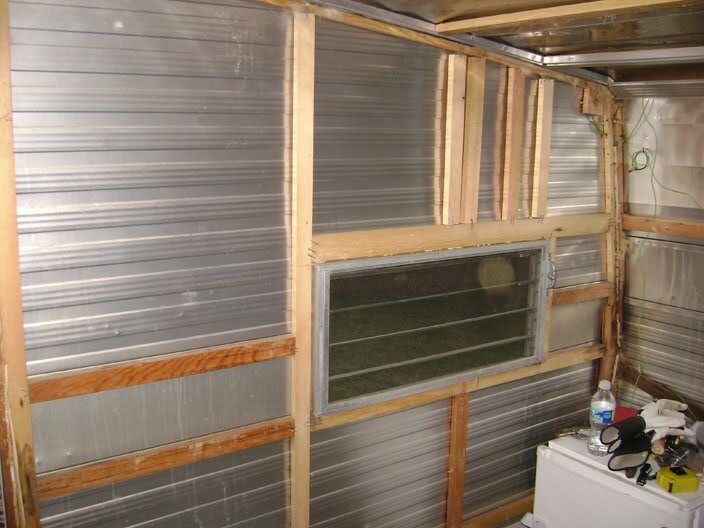 Just an FYI to everyone out there, Home Depot doesn’t have 2x3s….Joel will have to improvise with a 2x4. 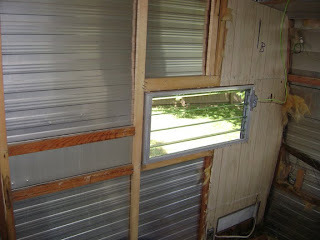 Improvise he does, he gets the 2x4 in there quick and things are looking better already. 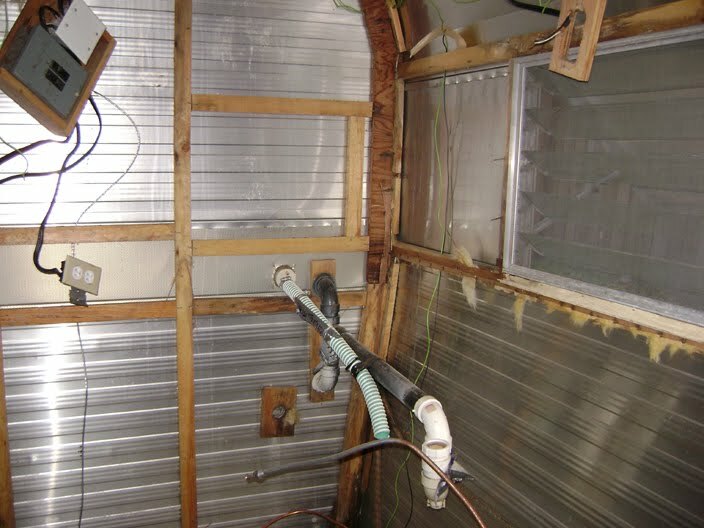 With Joel taking measurements to rebuild both back corners, I decide that it would be easier to work if I peel up the side bottom panel of skin. To do this I first need to remove the J-molding holding the skin and the wheel well together. One screw out….good, 2 screws out….HOLY CRAP, did the whole side just fall?!?!?!?!? Yep! The whole bottom of the side wall frame was rotted out and the ONLY thing holding the side up was 2 screws on the wheel well. PERFECT! I jump inside Belle and push up on the roof with all my might all the while screaming at Joel to hurry and cut a support post. At this point Joel is really mad at me for screaming at him and at Belle for being a piece of crap, but he gets a support post in just in time for the wind to start ripping through Belle like a hurricane. 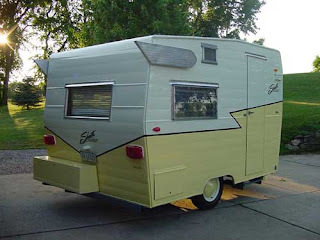 Suddenly my dreams of pulling up to the river campsite with everyone’s eyes turning green with envy as they gaze upon our Belle were vanishing before my eyes. Will we have to sleep in a tent now? I don’t think I can handle that. I’ve only camped in a tent once and people, it wasn’t nice. It was pouring down rain the whole night with the rain drip, drip, dripping on my head all night long. I can’t do it again! I won’t do it again! Come on Belle, we can make it though this! The support post is only holding the roof up; NOTHING is holding the side to the trailer frame, so I’m gripping my hands around Belle’s scrawny bones to keep her from flying away. I had to stand in there for about an hour while Joel rebuilt the back corner to get the side somewhat secured to the frame, just repeating to myself, “please don’t fall, please don’t fall….”. Working in the high winds and a bit of rain, Joel was a trooper and got the job done enough to call it quits for the night. I bet he wished he had chosen to work on the fence. The next morning I rushed outside to make sure Belle was still standing. Standing she was, albeit leaning a bit to the left. 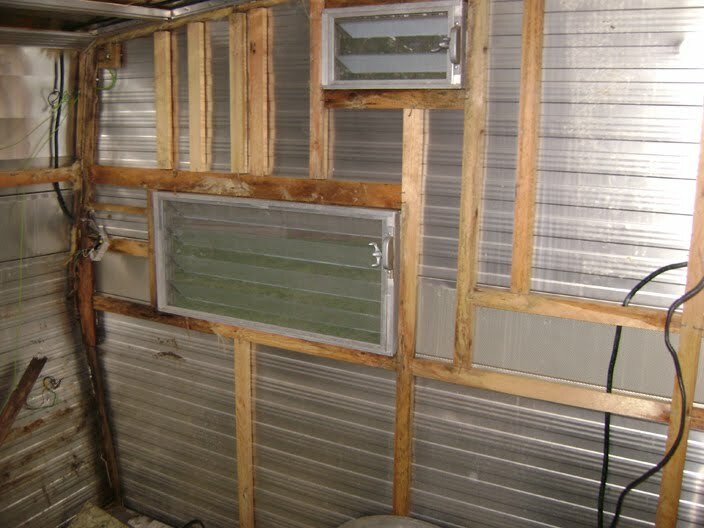 The back side wall was rebuilt and connected to the frame, but the front of the side wasn’t yet. Another day. A couple of days later we were able to finish rebuilding the bottom wall frame and secure it to the frame. Yay!!! Belle is standing straight once again. It’s scary to think that only 2 screws were holding the side on and that the whole back wall and a piece of the back frame were completely rotted. How did we ever get this thing from Illinois to Tennessee in one piece? I must have invoked my She-Ra Princess Power today because it went very smooth. I was able to successfully get Belle down to the bare bones. I can see that I need to replace a few of the "studs", but all in all not too bad. Tomorrow will be spent going over things with bleach and trying to get the vinyl flooring up. Joy! 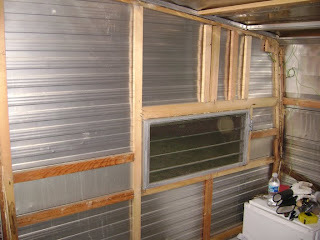 Check out the before and afters. Wow! OK so I've had a bit of a gap in progress. I got a surprise visit from the rents...that's parents to you old folks out there. LOL! It was a very welcomed visit as my dad hadn't seen our new old house yet.....and yes he loved the purple green and red that I painted it. Belle and I both got a rest from destruction until Tuesday morning. With the parents on their way back to Texas, I set my sights on gutting Belle to the "studs". I started out tackling the carpet; yes that's right carpet in a camper. Wha?!?!?!? Not just one layer of carpet either, 4 different kinds of carpet in 2 layers. Some stapled, some nailed and some glued, stapled and nailed. I actually had to use a pry bar to get all of the carpet out. Sheesh! Carpet out! Moving on to the last of the cabinets....the kitchen. 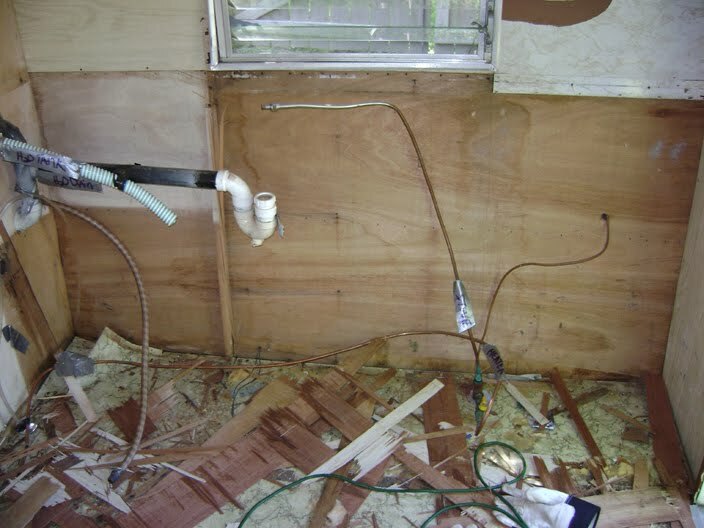 So I proceed to disconnect the plumbing...yuck...there's water in the line. Heebie jeebies. At this point I'm really proud of myself, I was able to muscle out these cabinets with no problem. I must be getting some guns from all of this. Yeah right! Kitchen no more.....notice all of my labeling with the duct tape. LOL! Now, somehow, I've got to remove all of the side panels in one piece so that I can use them as a template for the new birch panels that I will be installing. Easier said than done. I started removing all of the nails and staples from the side panels when I decided that I really needed to start with the ceiling. I can say one thing for sure....this roof didn't leak. 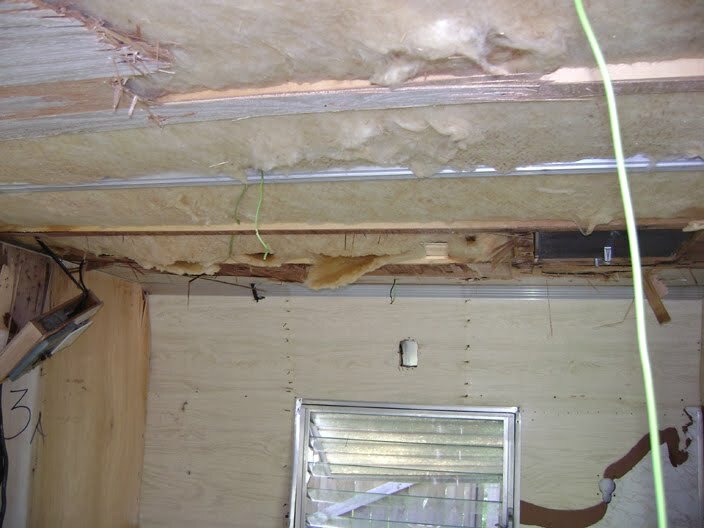 These ceiling panels were really in there....glued, stapled, nailed and in a bracket....and they were solid too or as solid as a 1/8" panel can be. I was really having a hard time, but I continued...this was not going to get the better of me. I got a couple of panels off and realized that while yanking on the ceiling panels, wood bits were falling down the v-neck t-shirt I was wearing and making their way down my overalls to you guessed it! Must take a pause to wiggle these pieces down the pant leg. Holy crap its getting hot at this point. It was like 85 in Nashvegas yesterday. Isn't it only April? Moving on to the side panels. 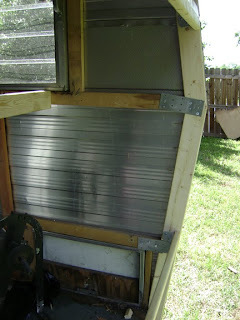 It took a whole lot of wiggling and staple removing to get just one of the panels off when I started itching like crazy. My arms and chest were on FIRE. While I was yanking on the ceiling panels, not only were wood bit falling down my shirt, so was the insulation. I literally had to run to the house and immediately shower. Only half a days work. At this rate I'm never going to finish on time. 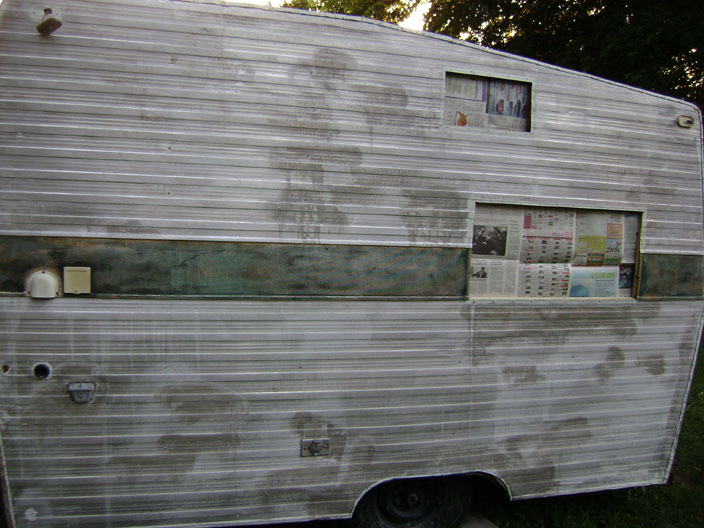 I need the Restoring a Vintage Camper for Dummies book....anyone out there have it? So here is where I left things yesterday. I have no doubt today will be a better day. Yes I'm wearing long sleeves and pants! No wood bits going near my cha cha today. 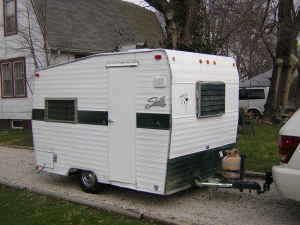 Except with a green Z stripe and purple bottom....and chrome hubcaps. Saturday started out just like any other day with Belle. I thought I would be pulling out the appliances and heater, but she had other plans. I got the stove/oven almost out when I thought I should double check to make sure the propane tank was off. Check! Its off, couldn't turn it at all. So I proceed to disconnect the gas line to the stove and its stuck. Of course! Moving on. I start to disconnect the heater when I hear the hiss of gas coming from the line. I figure its just what's left in the line and continue disconnecting. It wasn't until the whole thing was disconnected that I realized the gas was NOT off. You saw that coming right. I ran to the tank and tried my hardest to turn the knob to no avail. Quickly the camper is filling up with gas and I am panicking. Here I had been working so hard on this thing and its going to blow up. With all the windows open already, I did the only thing I could do......just let the gas tank run out. It must have been a full tank cause I had to wait the whole day for it to air out. 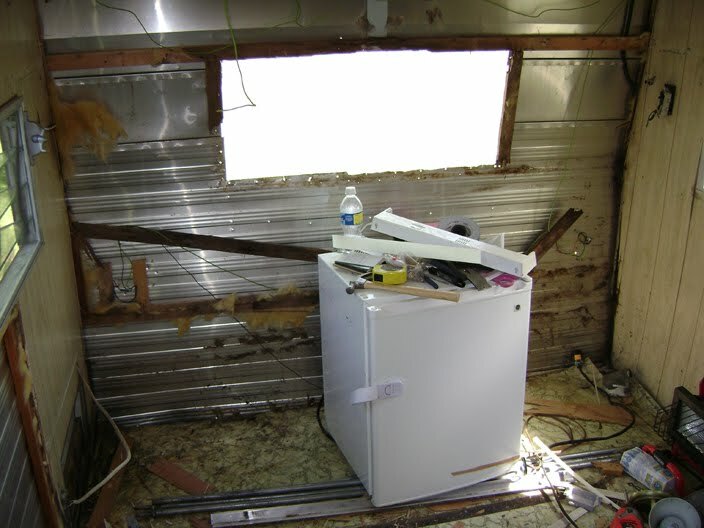 Not to be deterred, I went out that night to remove the stove as well as all of the knobs and hinges. Not much for a whole day. Sunday went much better...ha...Joel was here....although that really doesn't say much cause he lets me do most of the work saying its my project and only stepping in when the muscle is needed. 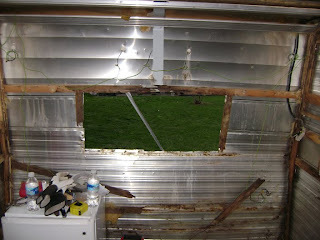 Bunk out, back wall crumbled...in pieces and out. Most of the cabinets out too. Progress! 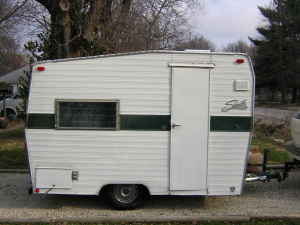 Yesterday was a long one, but 13 hours, almost 900 miles, 2 1/2 tanks of gas and countless bathroom stops later...thanks Joel.... we arrived home safely with our brand new old 1968 Shasta Compact travel trailer. We thought long and hard what to name her finally deciding on Belle. It seemed only fitting to name here after our street since we were going to paint her the same colors as our house. Joel voted for Bosco......he lost. 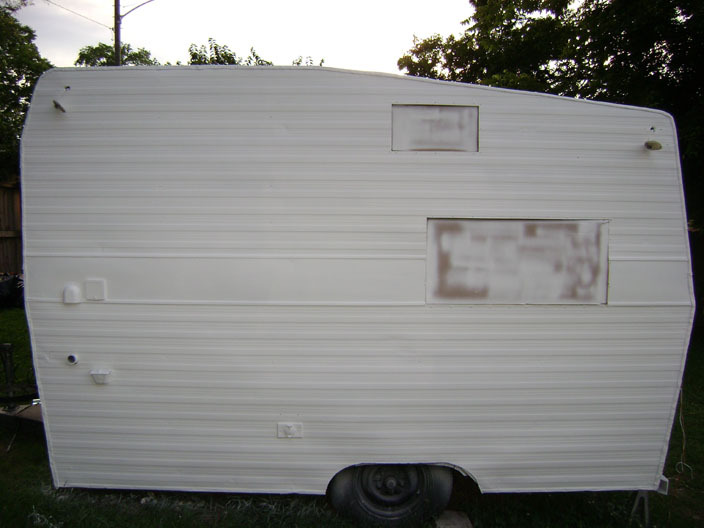 Join me as I dive head first into restoring a vintage 1968 Shasta Compact travel trailer. I have until June to complete the project so that we can go on a white water rafting trip with a bunch of Texas Aggies. Gig'em!